I was down in San Diego visiting my parents for Memorial Day weekend when this recipe showed up in my Google Reader. It was 9 at night and my parents, sister, and I were all sitting around watching TV, stuffed from dinner and a party earlier in the day. I made this cake thinking we would taste it before bed and eat some of it the next day. Which we did. Actually, we finished it the next day. And made two more as well. Oh yes, it was that much of a hit! The second time around, I made it a lot healthier by making a few substitutions: I replaced the butter with applesauce (tablespoon for tablespoon), the sugar with Splenda, and the flour with whole wheat flour. And it still got two thumbs up from everyone! It’s light, moist, delicious, and incredibly simple to make. Notes: Since I was baking at my parents’ house and didn’t have my cake pans, I used a pie pan and it turned out just fine. I also made my own buttermilk (using Lactaid!) by adding 1/2 tablespoon of vinegar to the 1/2 cup milk and let it sit for 10 minutes. And finally, you can substitute any berry you wish. At low speed, mix in flour mixture in three batches, alternating with buttermilk, beginning and ending with flour, and mixing until just combined.Spoon batter into cake pan, smoothing top. Scatter raspberries evenly over top and sprinkle with remaining 1 1/2 tablespoons sugar. Bake until cake is golden and a wooden pick inserted into center comes out clean, 20 to 25 minutes (mine were all done in about 18 minutes). Cool in pan 10 minutes, then turn out onto a rack and cool to warm, 10 to 15 minutes more. Invert onto a plate (I skipped this part and just cut, sliced, and served–much easier). Did you replace all the butter with applesauce? Or just partial? I replaced all of it–it was only half a stick (four tablespoons). wow sounds popular! i think i need to make this soon! this cake must have amazing texture. 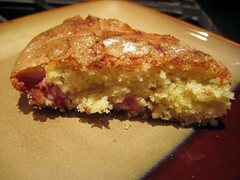 I adore buttermilk cake with fruity additions! I am such a fan of buttermilk in baked goods. I adore this! I saw this recipe at Smitten Kitchen a few days ago and it looked pretty amazing. I’ll have to keep the healthy options in mind when I make it (though this one wasn’t as decadently bad for me as the Shaker Lemon Pie). Wow, sounds like the family absolutely loved it! I can’t wait to try out this recipe. Strawberry buttermilk–I don’t think it gets much better! Buttermilk does such wonderful things for cake, and I can only imagine how moist and tender this cake is. Delish! I made this twice. I used blueberries for one and strawberries for the other. blueberries were the favorite. did yours stick to the pan? I buttered and floured, but both of mine stuck to the pan a little. any suggestions? This looks like the perfect summer dessert! Can’t wait to try! Hmm. Mine didn’t stick to the pan at all. I actually used Pam (rather than butter) and floured. I don’t think that would make a huge difference though. And my berries didn’t sink either, maybe because I sliced the strawberries into small pieces? Sorry I’m not much help here! Wow! sounds delicious..i wanna make it soon…i was wondering about the ingredients..one of my friend introduced me to a great source http://www.myethnicworld.com where i can find gamut of food products from around the world. I made this a couple of weeks ago for a cookout at my Aunt’s house, it was a big hit so much so that my Aunt wants me to make it this weekend. I bought to much strawberries so I put a nice pattern on top. I saw this at Smitten Kitchen’s website and had been imagining how tasty this would be. Anything with buttermilk sound warm and comforting to me for some reason. Fantastic crumb on yours! ok, this is good, but i think i should have read the part about laying the strawberries on top more carefully…i mixed a few of them in the batter and got me some gooey spots….still tastes good though.